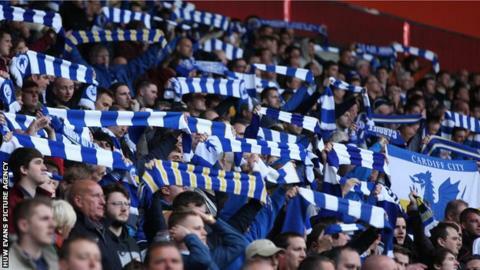 Cardiff City will return to playing in their home blue strip from Saturday. Owner Vincent Tan gave the go-ahead during overnight boardroom discussions, after a decisive consultation meeting with supporters on Thursday. The Malaysia-based businessman has also sanctioned a change of badge to give the Bluebird mascot more prominence. The rebrand to red was controversially introduced by Tan in June 2012 after he bought the club, and the red shirt will remain as Cardiff's away kit. The Football League has given its permission for Cardiff to change their playing strip mid-campaign and the players will wear blue shirts for Saturday's home Championship game against Fulham. Tan's rebranding of the club, whose nickname is the Bluebirds, was undertaken to generate "appeal in international markets", but he has now been persuaded to reverse the decision. Cardiff were on the verge of administration when Tan took over the Welsh club in May 2010 and survived three winding-up orders in the 2009-10 season over unpaid taxes. "The Christmas and New Year period has given me time to reflect on events of the last year. Spending time with my family has had a profound effect upon me, my mother... spoke to me on the importance of togetherness, unity and happiness. Cardiff City Football Club is important to me and I wish to see it united and happy." An outstanding debt of £24m to main creditors Langston - whose spokesperson is former Cardiff City owner Sam Hammam - was settled in July 2013. In January 2014, Cardiff City reported a loss of £30m for the 2012-13 season, when they were promoted to the Premier League, and the club's overall debt rose to £118m, with just over half - £66m - owed to Tan. Cardiff were relegated back to the Championship after one season and currently sit 12th in the table. Russell Slade's side return to league action against Fulham on Saturday following their FA Cup third-round win over Colchester United, notable for a record-low attendance of 4,194 for a football match at Cardiff City Stadium. Slade has described the club's move back to blue as a "giant step" which will allow them to sustain future success. "This is a fantastic opportunity to build a new platform and put the bricks in place to rebuild and start again," he said. "If you're going to be successful in any business, any football club, you need everyone pulling together as a unit. "My job is to focus purely on football and preparing the team for games., but if your football club is even slightly dysfunctional these things can have a detrimental effect. "I believe this will be a giant step forward to go with the traditional blue. "The owner and I have talked about the shirt and he was aware of the issue. He was not closing his eyes to it." "If we can play in blue on Saturday I would expect it to be the best atmosphere I would have experienced here and probably, for some of the players, it would be the best they have experienced for a long time. "We are always looking for momentum and this could be the spark to get us in the play-off places but it is down to the players as well as the fans."